Originally released as a limited demo CDR only available directly from the band, these debut recordings from Australia’s Sacriphyx were too exceptional to leave in so limited a form. Thus, NWN! is proud to officially release these tracks as a proper vinyl version for wide dissemination and as a precursor to additional upcoming Sacriphyx releases on NWN! that will soon be unveiled. Sacriphyx play melodic and dark black metal predominantly building upon the classic Greek sound established on such seminal albums as “His Majesty at the Swamp” and “Thy Mighty Contract.” These songs are at once epic and triumphant, melancholy and melodic epitaphs to the fallen. 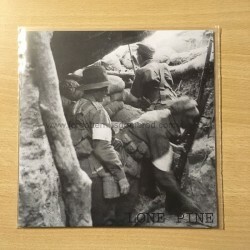 Lyrically poignant, the songs articulate the struggle, despair, and valiance of the battle of Lone Pine with an eloquence seldom seen in modern metal. In a scene often overly obsessed with tongue-in-cheek satanic imagery, Sacriphyx’s realistic yet unpretentious demeanor provides much needed elements of realism and emotive depth within the context of the extreme metal underground.